Nothing says "I love you" more than getting hitched beneath a gaping shark's mouth. For the rest of their married lives, my brother and his wife will be able to look over their wedding album and relive the tender moment they committed themselves to one another beneath a 10-foot spread of razor-sharp teeth. 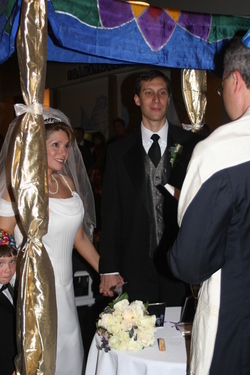 Oh sure, they erected the traditional chuppah, or wedding canopy, a lovely floral banner by an artist friend of the bride's. It coordinated nicely with the yarmulkes (skullcaps) with vivid fish patterns -- you had your choice of clownfish or sharks. Was there some fishy symbolism in all this? I wonder. It takes no small amount of creativity and chutzpah to marry at an aquarium, but it has to be one of the most fun weddings I've ever attended. My own nuptials were such a serious affair, I'm almost embarrassed to admit I was there. We started with hors d'ouevres by the Petting Gallery, where, if you tired of cheese cubes and fresh fruit, you could reach in for a horseshoe crab or sea sponge or other non-kosher delectables. Just kidding! You had to put them back. The crackers wouldn't hold a whole starfish anyway. While I caught up with friends and relatives, oversized fish slid past in burbling tanks and classical musicians played by the glow of a jellyfish display. People who know my baby brother weren't the least bit surprised. He's the easygoing sort, all about kicking back and enjoying yourself. Not to flog the marine metaphors, but he's always cast a wide social net and anyone ensnared since earliest childhood seems reluctant to swim free. Heck, the younger sister of his kindergarten best friend came. I threw my arms around two grinning redheads and asked what the heck those middle-aged farts were doing here? I remembered them -- and a half dozen others in attendance -- as attitudinous high schoolers huddled over many a round of Dungeons and Dragons at our kitchen table. They cast "No Big Sisters Allowed" spells to keep me at bay, and now find themselves charmed into submission by wives and kids and mortgages. His college frat buddies turned up in force, though it's been 17 years since their last kegger. An old boss from nearly a decade ago flew in from California. Cousins shook loose from the family tree that no one'd seen in years. As usual, our tribe overwhelmed the other half. At my wedding, my side numbered 100 to the groom's 10. Yes, 10. This time, the bride's family gave a somewhat better showing, but were still outnumbered by the largest collection of neurotics, gossips and goofballs outside of Congress. We ate, we danced, we watched the seals flop around on rocks. What else is there? Mazel Tov, Larry and Joyce. Thanks! Alas, we weren't able to partake of a raw bar or clam bake, as the bride keeps kosher and set certain limits about what she'd allow. I've never had the privilege of attending a Vegas wedding, but I'm sure I'd enjoy it as soon as I stopped giggling.